A TREASURE trove of historic photographs and stories about Newcastle City Pool and Turkish Baths has been brought to light by leisure charity Fusion Lifestyle. The Grade II listed building is due to reopen in early 2018 after a £5 million redevelopment by the company, but many new bathers will be unaware of the 180-year history of the site. One incredible photograph from local archives seems to show construction of the Newcastle City Pool and Turkish Baths before it opened for public use in 1928. A horse-drawn cart can be seen on what is now Northumberland Road, as men unload building materials in front of the temporary hording. The iconic entrance pillars are already taking shape in the building’s distinctive neo-Georgian style. But there is still some work to do, as the cavernous pool hall has only three walls. But the history of baths on this site goes back even further, to when famous Newcastle son John Dobson initially built private baths in 1838 at a cost of £9,500. Back then the baths faced east onto College Street, and had a strip of gardens at the entrance, as in this rare photograph from 1890. During the 1940s–60s, the pools were covered over in winter and played host to a range of events including dances, exhibitions and even boxing matches. The baths were closed in April 2013 but a community campaign by Re-open Newcastle Turkish Baths Group drew attention to the building and Fusion Lifestyle saw the opportunity to add the building to is impressive UK portfolio. Fusion Lifestyle ploughs all profits from its operations back into the business to provide affordable health and fitness facilities for all. The redevelopment will bring the pool and Turkish Baths back into operation, as well as seeing the introduction of a new spa, treatment rooms, fitness suite, exercise studios and café. Peter Kay, Chief Executive of Fusion Lifestyle, said: “We’re so lucky to have rediscovered the amazing past of the baths and we’re proud to give this historic building a proper future for people in the North East. Since Victorian times there have been more than 600 Turkish Baths operating in the UK, but the new Newcastle City Pool and Turkish Baths will be one of only 18 left in operation. Re-open Newcastle Turkish Baths Group are undergoing pre-feasibility research and business planning to look into options for re-opening Newcastle’s historic Grade 11 listed Turkish Baths thanks to £10,000 grant from the Social Investment Business. The Baths and Pools were closed to the public on 28 March 2013 as part of Newcastle City Council’s budget cuts. The Re-open Newcastle Turkish Baths Group have been meeting regularly to look at ways to re-open the baths and pools: the grant will allow them to take this work further. As well as enabling them to assess the current state of the building and decide what work needs to be done, the money from the Social Investment Business will help create new business models to effectively drive the project forward. The business plan will be presented to Newcastle City Council with the hope that a strong case can be made for The Turkish Baths being re-opened, benefitting Newcastle’s residents and visitors. “This is great news for the group, and a vote of confidence for our campaign to re-open the Turkish Baths. Over the past few months we have been investigating the viability of re-opening The Turkish Baths and we delighted to be working with experts from Jesmond Community Pool to draw on their knowledge and experience to help drawn up are with new business models and options. We hope that we can make a strong case to present to Newcastle City Council and be part of their future plans for the building. Two conservation plans and reports done for Newcastle City Council in Februrary 2010 by North East Civic Trust detailing the architectural and heritage significance of the Pools and Baths and lay down guidelines of how the features of the buildings should be maintained. City Pool was one of only 19 public baths in the UK opened in the 1920s that is still in use today. The Grade 11 listed Turkish Baths are particularly important from a heritage point of view, being one of only 13 remaining Turkish Baths in the country. In fact, only 10 of these are open to the public with only 7 (including the baths in Newcastle)* being listed buildings. When open, the Turkish Baths were not marketed effectively to the public. In response to its proposed closure, a survey completed by users showed that current customers would support a small increase in cost per visit which would have generated an extra £100,000 a year. It is understood that Newcastle City Council had been in discussion with various organisations to take over all or part of the City Pool and City Hall building, with the priority of maintaining the City Hall, although they are no longer in active discussions with any of these organisations. Re-open Newcastle Turkish Baths groups would be interested in hearing from any organisations who would be interested in working in partnership to bring the Turkish Baths back into use or have an interest in any other part of the building to look at possible collaborations. Individuals interested in being part of the campaign or lending their support can join the mailing list by emailing SaveNewcastleTurkishBaths@gmail.com or following Re-open Newcastle Turkish Baths on facebook. Save Newcastle City Pool & Turkish Baths have been successful in their bid to register Newcastle City Pool & Turkish Baths as an Asset of Community Value. The Grade 11 listed Baths and Pools were build in 1927 but closed to the public on 28 March 2013 as part of Newcastle City Council’s budget cuts. It was Newcastle City Council itself who still own the now closed City Pool & Turkish Baths who had to approve the asset nomination. The letter states that the council recognises the building as an asset that furthered the social wellbeing of the community and still has the potential for a well-being use for the community (although they say they believe the Pool is unviable). The registration of the City Pool and Turkish Baths as an asset of community value means from the date that the council put it on the market, community groups have 6 months to develop a Community Bid to manage and run the Pool and Baths. However at the end of the 6 month period the council could still choose to sell it to whoever they choose. At present Newcastle City Council have not confirmed a date when they plan to market the building. It is believed that the Council are still waiting for a consultants report that they commissioned looking at the proposal that the Theatre Royal manage the City Hall and the possibility of turning the small swimming pool into an additional bar for the City Pool. Save Newcastle City Pool & Turkish Baths are still waiting on further details from the council on their plans to market the site. However they have had good conversations with funders about feasibility grants to take them to the next step to manage and re-open the Baths and Pool and potential Heritage grants for the restoration of the building, as well as with individuals who can bring their skills and experience to the project. 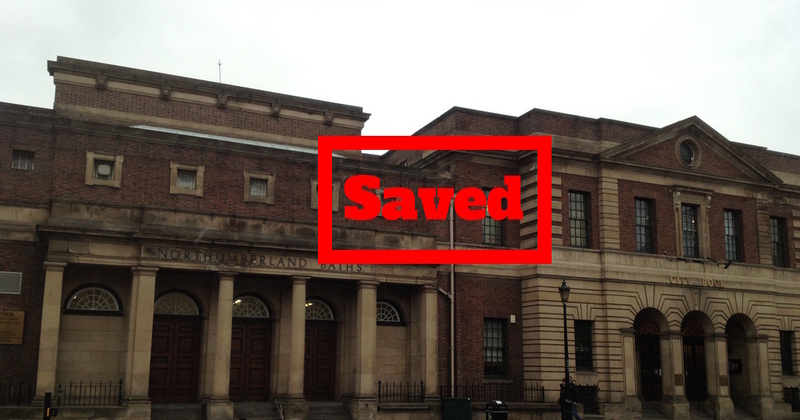 Save Newcastle City Pool & Turkish Baths are holding a public meeting on Tuesday 4 February at 6.30pm upstairs at the Trent House Pub, where they will share the information they have discuss the next steps needed to take the bid forward. For further information about Save Newcastle City Pool & Turkish Baths or being involved in the future community plans please follow Save Newcastle Turkish Baths on facebook or email SaveNewcastleTurkishBaths@gmail.com.